MarketAds is one of the new ads network, here I am going to share with you all details about the network, the biggest strength about this ad network, they are having more than 10 years of experience in this field, so you can understand about their strength basically they are providing gap filling solution to advertisers as well as for publishers in this industry. As, I have already shared with you that this is one of the popular pop under ad networks, but the thing which make this pop under ad network different from others is that their own technology, what they are using, actually its been last three years I have been using pop under ads networks, earned $1000 and of course having target to earn much more, so here you got the break through to earn more money from ad networks. See, if you will use any PPC ad networks on your blog then only you will get paid if readers will click on the ads otherwise if they will not click, you are not going to earn any money, so here you will get a BIG advantage of using MarketAds on your blog, because you will get paid once people will come to your blog, so your work is only to get people on the blog, rest things will be done by MarketAds and you will earn money. Okay, people always looking at features of ads network, so here I have figure out few amazing features of this ad network, first of all I must say they have very good support team, which is BIG ad networks are missing, that is why advertisers as well as publishers face problem, I don't want any of my reader face such problem, that is the main reason I always write review article after looking at their support team, for MarketAds case its really very good, I must say that, this is my own personal experience. You will get very good ECPM rate, but it is always vary, because of traffic location, yeah if you are getting traffic from English speaking countries then it is always seen ECPM is much more than non English speaking countries. Daily payment, which make this ad network unique and there are few other networks also pay daily, that's why I love them all, including MarketAds. Getting approval from MarketAds is really simple, just apply for it and wait for the approval in general it takes only few hours. They got 10 years of experience in this field and which is pretty good. Here, I am going to share with you, steps for joining MarketAds, that's why you don't need to face any problem to get started with this ad network. First of all you need to click here for getting yourself on the official page. 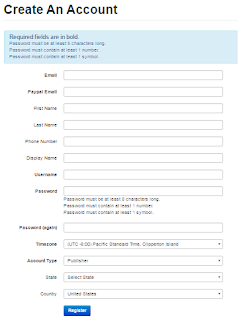 Now you will see a page, which will ask you to fill the form, here is the screen shot of it. Now you will have own password and log in ID, you can log in to your account, there you will see option, Publishers, just get your cursor there, then you will see option, Websites, just click there and then you will be on the another page, now you need to click on NEW, this option is on the top side of the right corner. Now you will ask to put information about your website, don't be in hurry take your time here to fill the form, because this is most important and at the end click on submit, that's it. After then you will see that your website is pending, I mean not approved just you need to wait for few hours to get approval from them, then you can generate code from the same tab and put it on your blog and start earning, So simple to follow. Yeah, this is the section for all advertisers, actually when I have start writing about good ad networks, I always tried to help publishers but later I realized, I must share information about ad networks for the advertisers, so this is the section only dedicated to advertisers, see I don't know what type of products you wanted to promote through pop up ad networks, like this one, but I will suggest you to go with CPA offer, because it converts much better than pay per sale product. This is my own personal experience, CPA offers can make you lot of money, actually last month I was trying with CPA offers to get much more knowledge about it, because one of my client was looking for such information. Minimum budget is only $5 to deposit, that is the great thing about this ad network, I mean you can start with very tiny budget. Pop under networks always help to increase revenue, so if you are looking for increasing revenue of your website or blog then it is recommended to use it and see the difference, I am sure you are going to see increase in revenue that is the real benefits of such type of ad network, so here MarketAds playing very important role to help advertisers as well as publishers. What do you think about MarketAds?